68 12" x 76" throw. 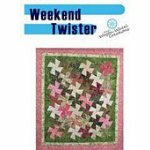 This quilt uses 10" fabric squares to make a simple to piece but difficult looking quilt. Makes a great present in little time. Uses Twister template.